Red alert! Over 40 billion dollars of America's national wealth is being shipped out of the country every single month. Our economy is being gutted and we are bleeding wealth and we are bleeding jobs. This is a distress call. Is anyone listening? Thousands of our factories and millions of our jobs are being shipped overseas. Over the past decade over 6 trillion dollars have been transferred into the hands of foreigners. Our national government is so broke that they constantly have to go and beg those foreigners to lend us back some of that money in order to finance our exploding debt. 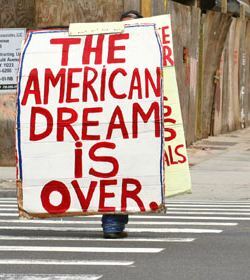 The number of good jobs continues to decline and there are millions upon millions of my countrymen that are unemployed. Can anybody help us? Mayday! Mayday! Mayday! #17 Back in 1998, the United States had 25 percent of the world’s high tech export market and China had just 10 percent. Ten years later, the United States had less than 15 percent and China's share had soared to 20 percent. #19 In 2002, the United States had a trade deficit in "advanced technology products" of $16 billion with the rest of the world. In 2010, that number skyrocketed to $82 billion. #25 In 2010, the number one U.S. export to China was "scrap and trash". Today, over 44 million Americans are on food stamps and over 47 million Americans are living in poverty. This is not an accident and it didn't happen overnight. Our economic policies are absolutely killing us. Not that a college education is a ticket to success in today's world. According to the Economic Policy Institute, the unemployment rate for college graduates younger than 25 years old was 9.3 percent in 2010. I hope that you are enjoying "the low, low prices" because they come at a very high cost.